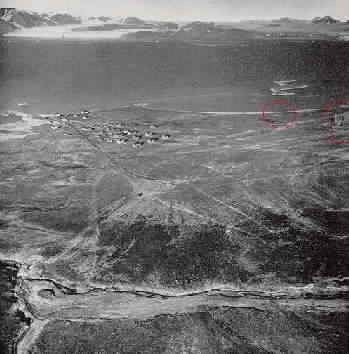 Photo taken from a 1939 Dutch book showing the settlement of Ny Ålesund (Kings Bay). The skeleton of the 1926 hangar is barely discernible at the far right edge circled in red. The mooring mast, also circled in red, is to the left of the hangar and closer to the water. 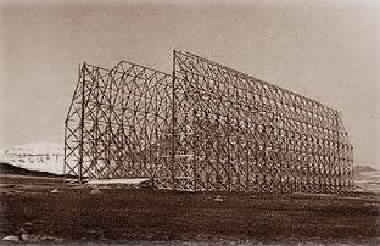 For a more detailed picture of the hangar from the same book, see below. Paulus Veltman supplied these pictures as well as the one on the preceding page and they are used with his kind permission. The hangar picture is from his website, North-an Intuitive Arctic Exploration. This site explores a variety of arctic and literary themes and is well worth a visit.